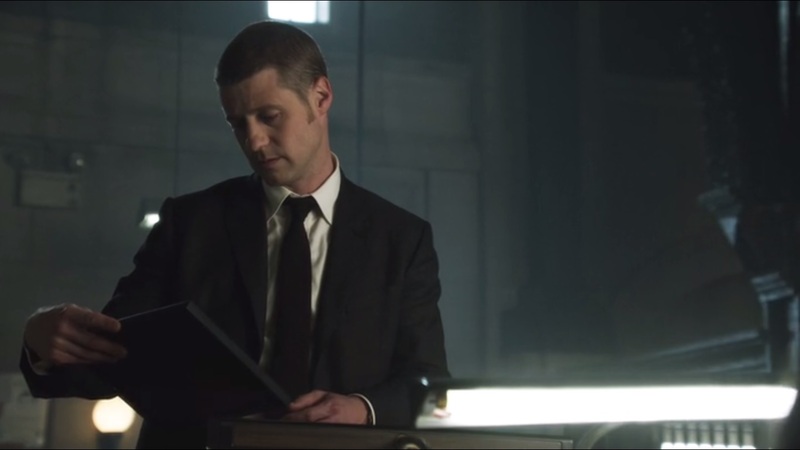 A Look at Gotham Season 1, Episode 5: “Viper” | What Else is on Now? This guy’s drug has got nothing on The Count’s vertigo. In “Viper,” the citizens of Gotham are none the wiser when they’re randomly given a substance from a man they’ve never met and soon realize that they should have more milk. Whoops. The episode begins with Bruce taking up a new hobby: creating a crime web. He’s still looking for a connection, though Alfred finds the effort pointless since it won’t help Bruce get his revenge. Bruce insists that he just wants to know how Gotham works. 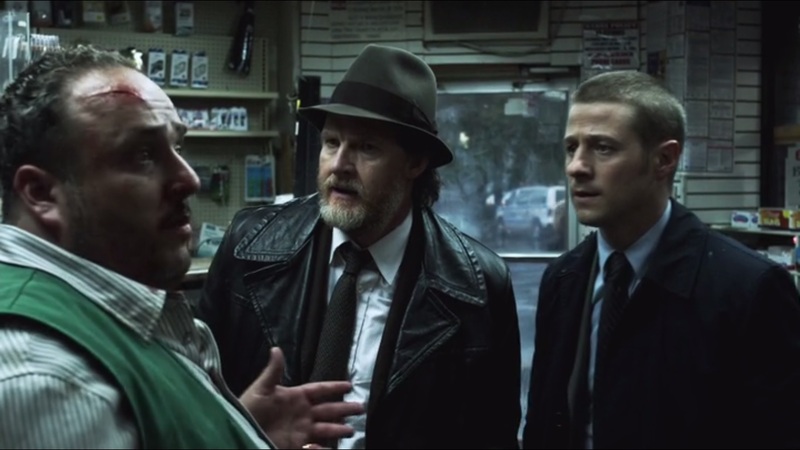 How would the likes of Falcone and Maroni get such big shares in the Arkham deal? If that were the case, Bruce feels that Wayne Enterprises should have done something about it. At the very least, Bruce’s new hobby doesn’t involve burning himself. 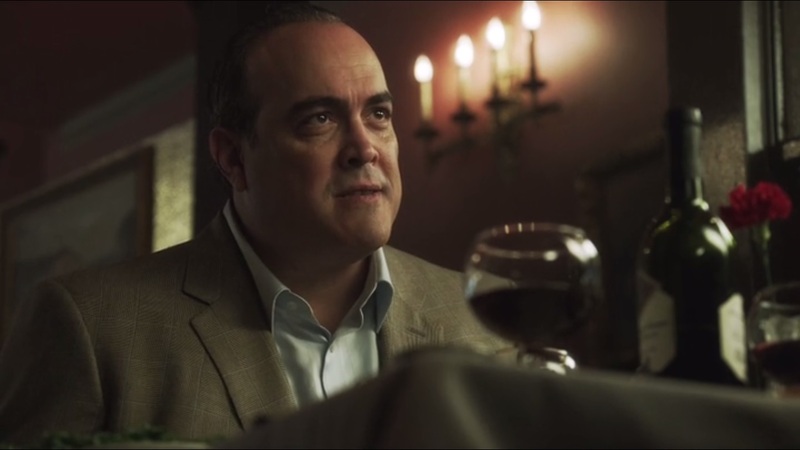 Maroni isn’t pleased with Frankie’s efforts at attempting to rob a casino in Falcone’s territory. Now that Maroni has a piece of Arkham, a casino should be easy, but it’s not. 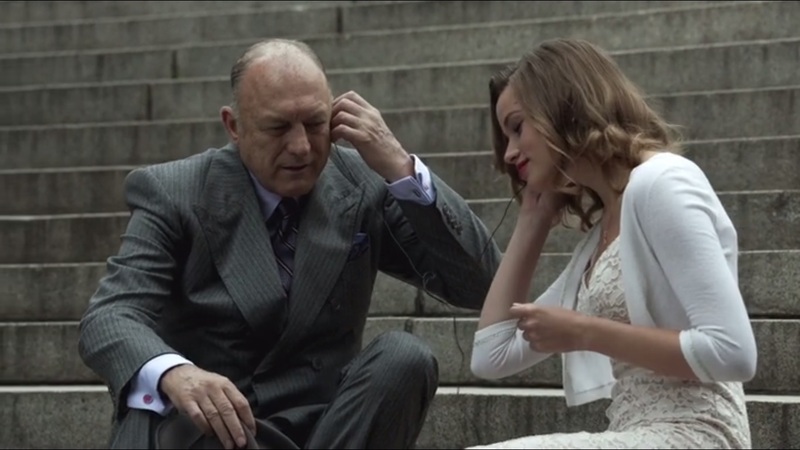 The point is just to get under Falcone’s skin by hitting him where it hurts. We then get a bit of honesty in the form of a man playing a guitar. His sign reads “Why lie- I need money for drugs.” It’s always nice when Gotham City can have even the slightest bit of honesty, you know? Observing him is another man whose name will become important later. 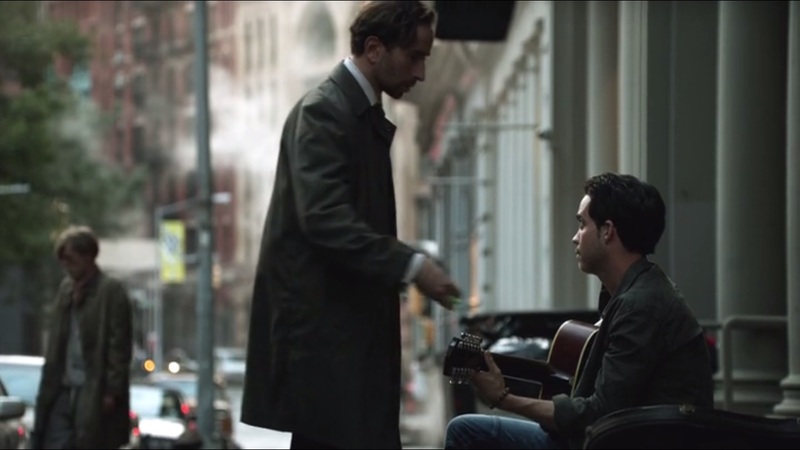 He drops a vial into the man’s guitar case and heads on his merry way. The man breathes in the vial and makes his way to a convenience store. Inside, he downs a carton of milk like it’s the first thing he’s had to drink in years. The owner doesn’t take too kindly to this, but his bat is useless against the intruder. Bullock attempts to introduce Gordon to the best burgers in Midtown, but Gordon suddenly sets his sights on a rather pointless appearance by Selina Kyle, as she makes off with a man’s wallet. When Selina makes her quick exit, Gordon and Bullock conveniently hear the alarm going off from a nearby convenience store. All right, why was Selina trying to be stealthy in broad daylight? Whatever. The store is now in ruin, but the owner soon emerges from his spot. He explains to the officers that his ATM was stolen, but it sounds unlikely that one man could escape a store with an ATM, but without the use of a getaway vehicle. Fish’s new…er, fish, Liza, played by Makenzie Leigh, isn’t a fan of Fish’s taste in music. She wants some excitement in her life. Patience, Fish says, as Liza is Fish’s secret weapon. Gordon, Bullock and Captain Essen watch the surveillance footage in amazement at this unknown man lifting an entire ATM with his bare hands. The two detectives found the vial in the man’s guitar case and it does contain traces of a drug. Nygma will have a read tomorrow. Meanwhile, the two plan to head out so they can ID the man. Falcone assembles his Legion of Doom- I mean, Mobsters of Doom- I mean, Mob Squad. 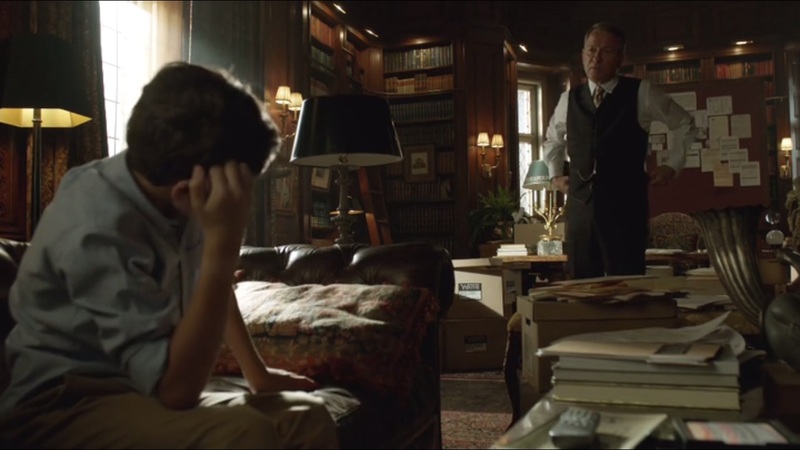 He tells them that they didn’t lose, but Maroni didn’t win either. The Arkham project was a business decision. One mobster in particular, Nikolai, played by Jeremy Davidson, calls for pushing back against Maroni, but Falcone won’t have that. Neither will Fish, as s he and Nikolai have a spat, though it’s soon ended by Falcone. And then Gordon and Bullock engage in what’s got to be some of the worst detective work shown so far: they take a photo of the man and literally go asking people on the street if they recognize him. Aren’t there more officers on the force than these two? Can’t they put out an all points bulletin? Release the man’s photo to the press? All right, whatever. One woman identifies the man as Benny and she’ll give up his location…for the nominal sum of $20. She’ll have to settle for $10. Bullock and Gordon’s cover story is that Benny came into an inheritance. Why the police would want to speak with him about that, I don’t know. Gordon and Bullock head to the location, which is littered with empty milk cartons and other dairy products. They soon find Benny, but he looks worse than before. His body hurts and he needs more. He tells the officers that he received the drug from a man with a mangled ear. When Bullock goes to arrest Benny, he’s overpowered. 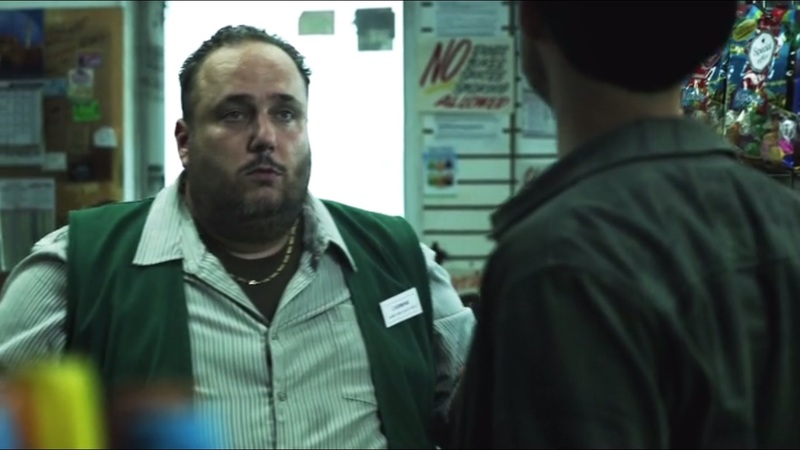 But the second Benny lifts the ATM, his bones collapse within and he’s soon crushed. 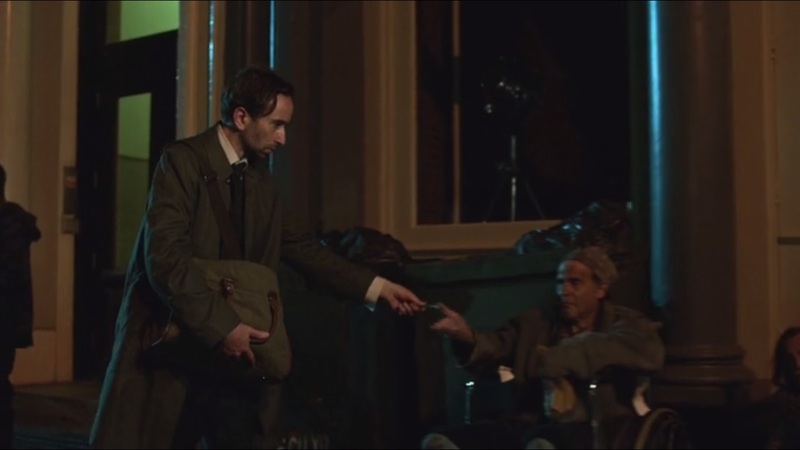 That night, the mystery dealer literally hands the drug out to anyone he can see, including the woman from before. And the people just accept it! What’s incognito? Bats are nocturnal, and so is Bruce Wayne. Not for long, as Alfred soon wakes him up to inform him about an upcoming charitable luncheon hosted by Wayne Enterprises. Bruce accepts the invite. He’s got some questions for the board about the Arkham project. If there’s a chance mobsters received shares from the Wayne Foundation, there’s the possibility that Bruce’s parents were involved, but he can’t think that they would do that. Alfred applauds Bruce’s detective work, but keeps his promise to not chuck all of the paperwork into the fire. Bruce then watches a breaking news report on the “Viper” drug that has struck Gotham. It gives users a euphoric sense of a power for a few hours until they then die a horrible death. And users are having a field day at GCPD. 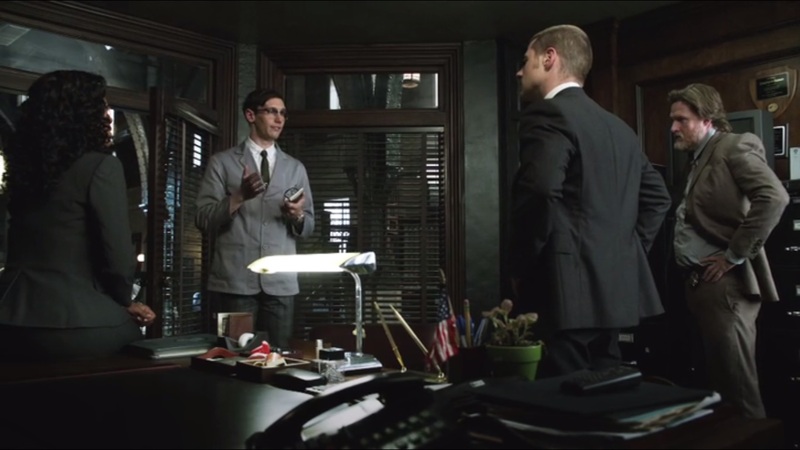 Nygma makes his way to Essen, Bullock and Gordon to give his analysis: the Viper drug activates unused DNA. The body burns calcium from the skeletal system as fuel, leaving the body craving for dairy products to replace the missing calcium. The body cannot keep up, however, so the bones crumble while the person suffocates and dies. Nothing like this has ever been seen before, which would explain Nygma’s excitement. Captain Essen believes that since there haven’t been any new reports in a few hours, it’s possible the drug has been exhausted to its limit. The problem is the dealer isn’t even dealing- he’s just giving the problem away. Bullock is fine with letting the worst of Gotham’s criminal element fight it out. The Captain isn’t sitting with that. This is also no easy drug to make. 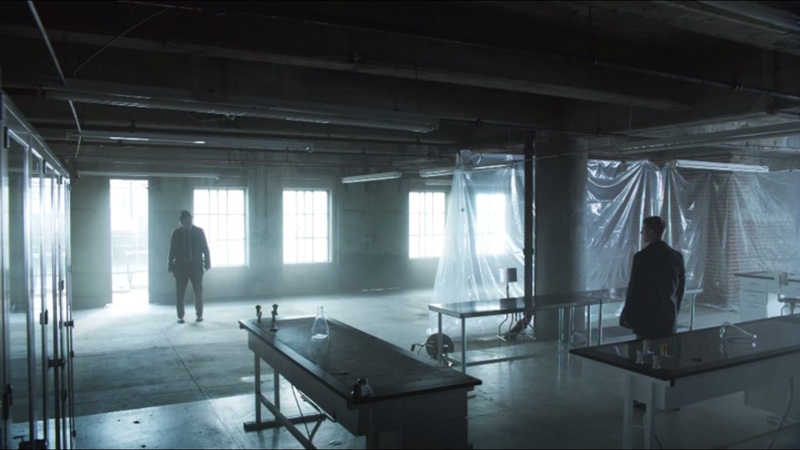 According to Nygma, it could only be done in a state of the art laboratory. The best of the best is WellZyn, a subsidiary of Wayne Enterprises. Essen can’t possibly see them being behind this. Oh, and an officer comes crashing through the window just in time for the prostitute from before to crumble and die. Fascinating. Maroni watches the news about the drug. He still wants to hit Falcone’s casino, though Frankie still believes they could lose a few men. Oswald overhears this and Maroni calls him over. When asked about his name, Oswald says that everyone there calls him “Penguin.” Really? When? When did that ever happen? 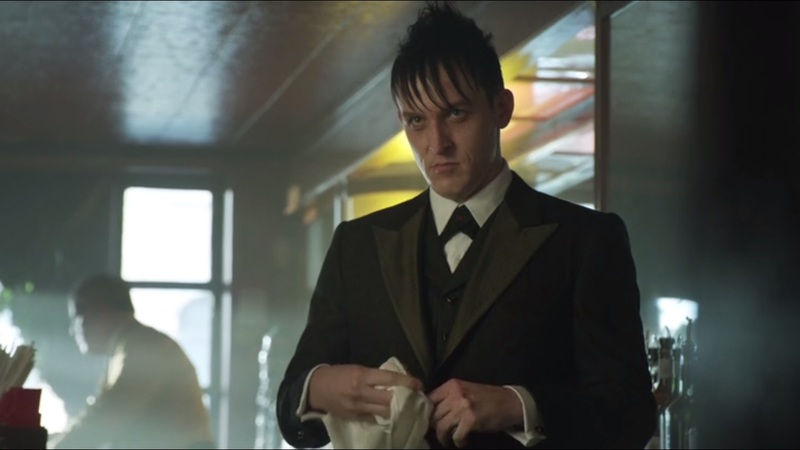 Oswald knows a janitor who runs the boiler room and says that Maroni’s men could get access to tunnels that few know about. The janitor just needs proper persuasion. Maroni likes this Oswald kid. He’s humble, but has some player in him. Feeling honest, Oswald tells his story about once working for Fish, being privy to details of the Falcone Family business and almost getting killed. 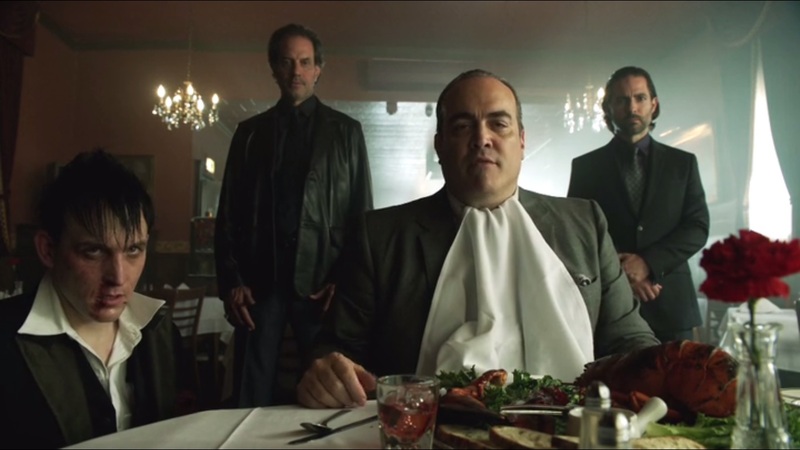 It sounds funny until Maroni slams his head against the table. 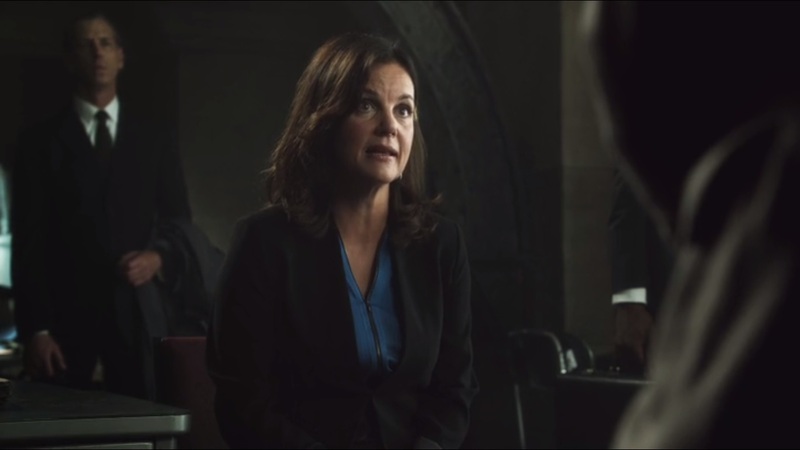 Back at GCPD, the officers get a visit from Taylor Reece, played by Margaret Colin. Reece works public relations for WellZyn and wants to help. When asked about the man with the ear, she confirms it is indeed a former employee and current drug handler: Stan Potolsky, played by Daniel London. Potolsky worked as a biochemist for several years, but became frustrated that he didn’t get to do more important work. He resisted any sort of help. There was also an incident last April that involved him cutting off his own ear after getting into an argument with a supervisor. The attempt was not very successful. After Potolsky had been terminated, he didn’t even bother clearing his desk. He just vanished off of the grid. 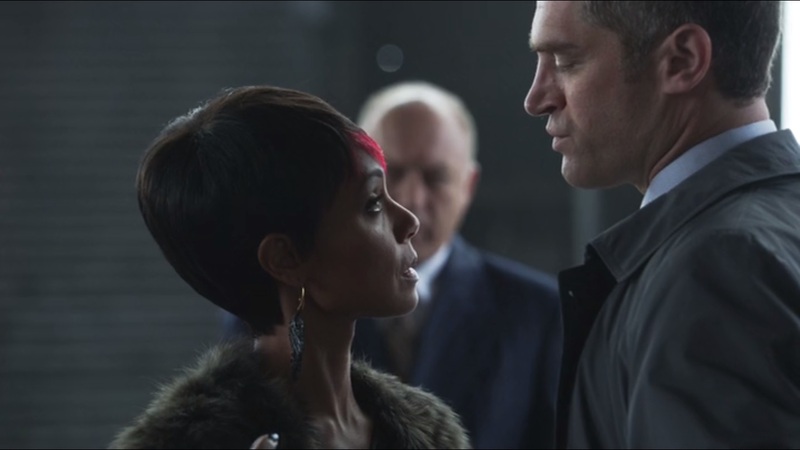 Gordon thinks that Reece is in on it, given how quickly she came to GCPD, but she denies it. Plus, Potolsky is a smart enough man that he can make his own lab if he wanted to. Gordon wants to comb the city for Potolsky, but Bullock has a better idea: all points bulletin. Now why didn’t they do that the first ti-oh, forget it. 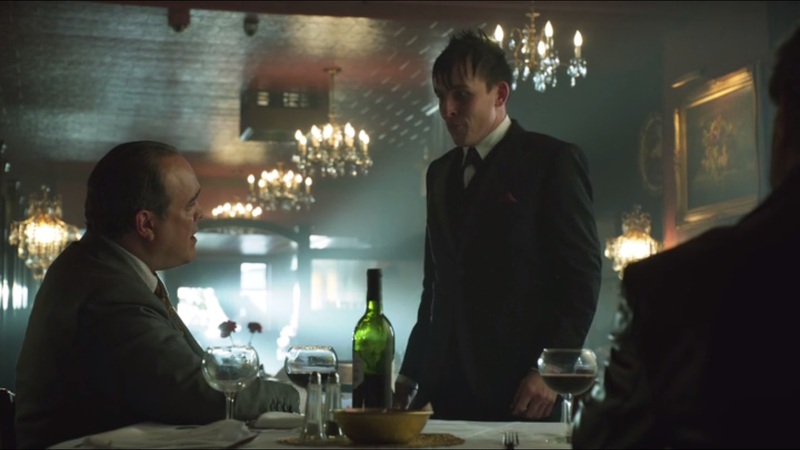 Frankie approaches Gordon about their mutual friend, Oswald Cobblepot. 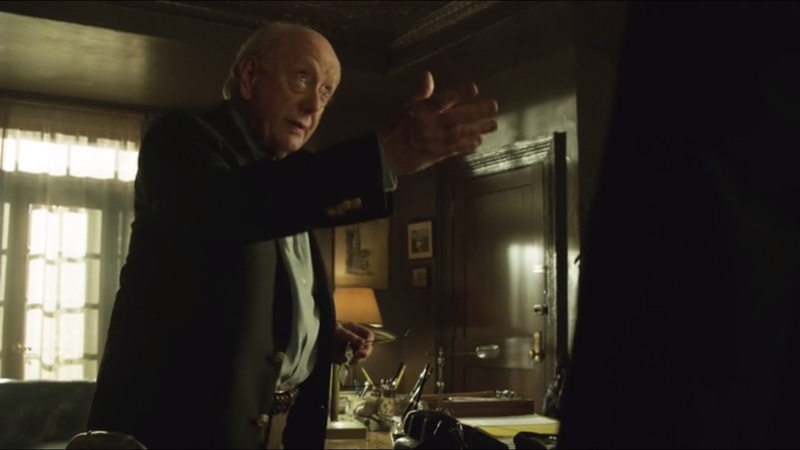 And if Gordon doesn’t come along, Oswald’s head will be sent in a bag to Falcone. As the two leave, Gordon goes through what must be the calmest kidnapping I have ever seen. He awakens before Maroni and a bloody Oswald. Maroni has just heard the most amazing story and wants to hear Gordon tell the exact same tale as Penguin. If they match up, Maroni is a happy man. If not, someone is lying and that someone will die. Gordon sings like a canary and discusses the Wayne murders and his role as a pawn in a conspiracy. 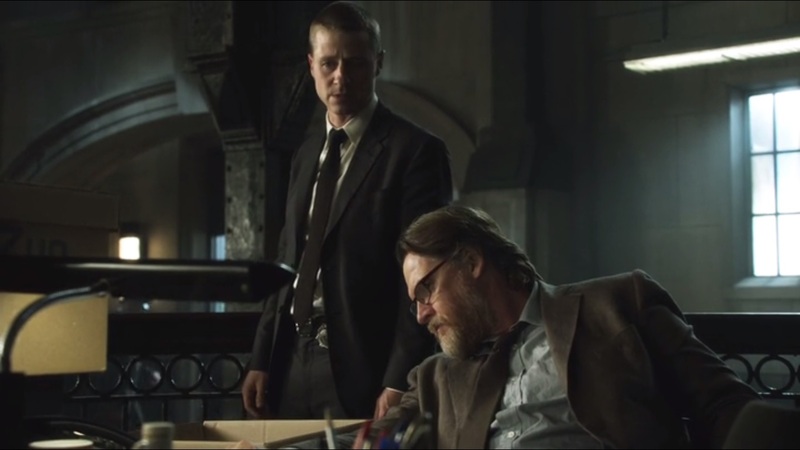 If Falcone, the MCU or GCPD even knew that Oswald lived, chances are Gordon would already be dead. Maroni is pleased. Most cops would freak out, but now Maroni is happy that he has a weapon to use against Falcone. He’ll keep quiet about this, but if he needs Gordon, he will call him. When Gordon returns, he finds Bullock going through a box of items that belonged to Potolsky. Obviously Bullock didn’t do a very good job, as the first photo Gordon plucks out leads them to a professor at Gotham University. This professor knew Stan as a student and the two kept in touch. Stan’s’ research led him to dark moral corners. He’d been designing pharmaceutical weapons to be used by combat troops. Viper was just the first batch. “Venom” took its place. Potolsky appealed to his bosses to end the program, but no dice, so he went to Thomas and Martha Wayne. WellZyn eventually revived the program after it had been shut down. Gordon can’t help but notice the professor’s lack of moral outrage over a formal student committing murder, but it’s because he planned this with Stan, who soon plans to deliver a statement. Bullock goes to arrest him, but is again overpowered until Gordon downs him with two shots. 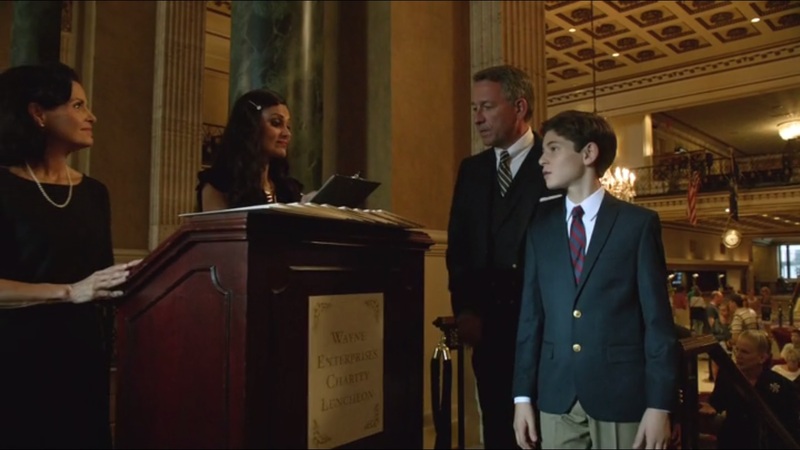 As the professor dies, he vows that Wayne Enterprises must pay and speaks of altruism. When Bullock asks what altruism is, Gordon responds with “charity.” Hey, wait a second! Yep, Gordon figures it must refer to the same luncheon the Wayne Foundation that Bruce and Alfred are currently attending. 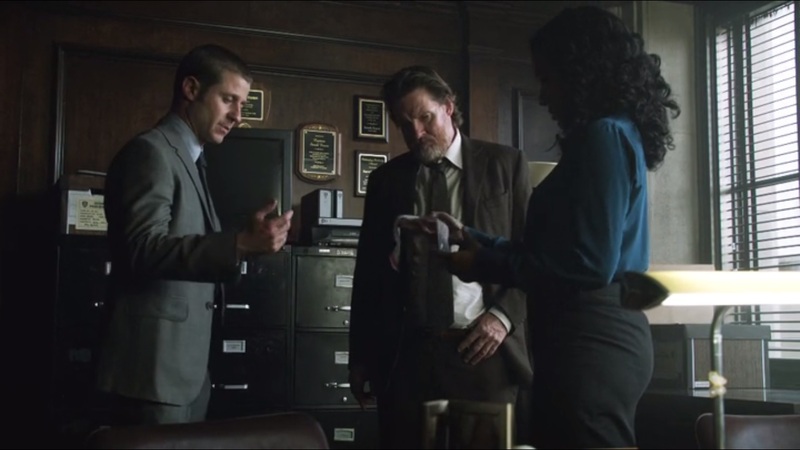 As Stan heads up to the roof to put his plan into action, Bruce meets with Ms. Molly Mathis, played by Sharon Washington, who was close with Thomas Wayne. Sounds good, but Mathis herself is not a board member. In fact, no board members are in attendance because they’re much busier. Middle management like Mathis attends in their place. Bruce brings up the irregularities he’s found in the Arkham project and still wants to speak with the board. Stan appears on the monitor and admits to making drugs for WellZyn. Bullock rushes in and clears the room just as gas begins to filter in through the vents. 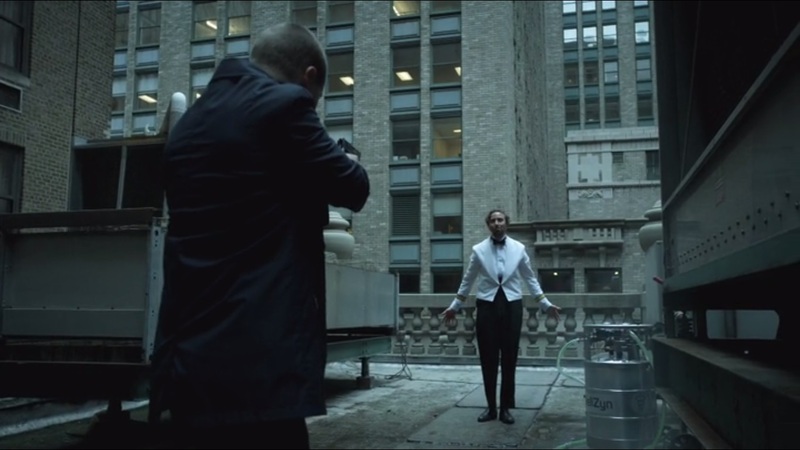 On the roof, Gordon confronts Potolsky, who has already accepted his fate. Before jumping to his death, he tells Gordon to look at Warehouse #39. 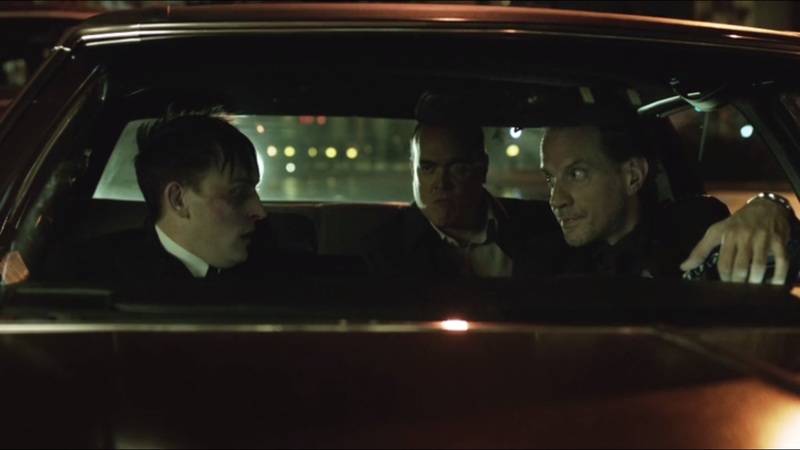 Oswald Cobblepot, true to his word, sits with Frankie and Maroni just as Maroni’s men emerge from the casino for a very successful heist. Oh, Fish and Nikolai plot to take down Falcone. Speaking of Falcone, Liza reminds him of his mother. Similar to The Balloonman, Potolsky is someone who wants to put a spotlight on Gotham’s elite class and show how corrupt they really are. But he preys on the common folk when he hands out the viper drug like candy. 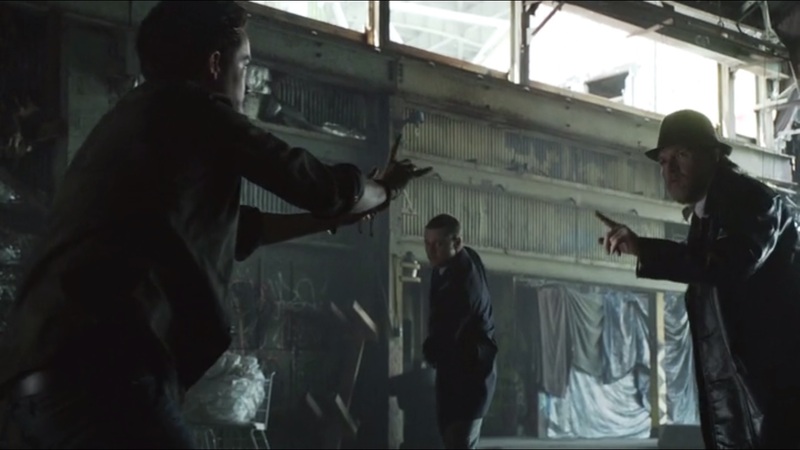 They seem to have a more physical impact on the body compared to The Count’s Vertigo drug on Arrow, but I digress. I think using Wayne Enterprises as something potentially sinister is a good idea. So now Bruce does have a reason to be as involved as he is this week. That’s fine with me, as he would want to get to the bottom of any irregularity that could involve his parents. It would certainly make him more committed to doing the right thing as opposed to the show giving us blatant symbols of him being inspired to become a vigilante. 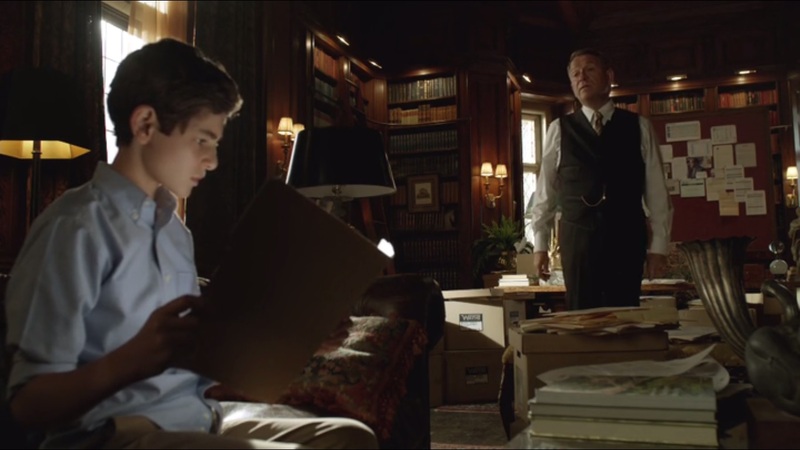 Plus I did appreciate the final moment where Alfred decides to help him with the investigation. If there’s one thing I liked about this episode, it’s watching the growing division between Falcone and Fish as she tries to screw him over. I found her little spat with Nikolai odd since it seemed like they’d been warring for a long time, but this was our first time meeting Nikolai. Not until the end did we see that it was all an act. Between this and using Liza, Fish is playing as many hands as she can when going after Falcone. At least she’s a bit more subtle in her approach this week, unlike Cobblepot, who learns the hard way that honesty is not always the best policy. 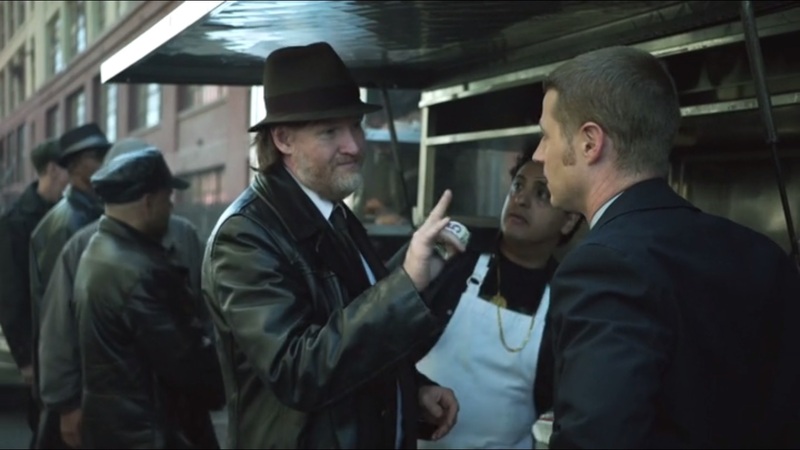 His honesty toward Maroni not only earns him some abuse, but he’s now dragged Gordon into Maroni’s circle of weapons to use against Falcone. Oswald tries to be cunning and work his way in. After all, he just got a promotion, so it makes sense that he’d want to work his way up the ladder if he feels he’s on Maroni’s good side. But saying too much put him in danger. Had Gordon told a different tale, Oswald might have found himself in the water again. And speaking of Gordon, I’m still not a fan of his convenient hunches. I mean, describing altruism with the word “charity” and then figuring out that Potolsky would be at the Wayne Foundation charity? What are the odds of that? How would Gordon even know about the charity in the first place? It’s not like he had any time to breathe in between the case and getting held up by Maroni in, again, one of the calmest kidnappings I have ever seen. I’m curious as to how no other officers or even bystanders reported a missing detective. But then, this is Gotham City. Maybe Gordon going missing was a blessing in disguise to the GCPD. Then there’s the box of Potolsky’s stuff. The very first item that Gordon finds is a photo of Potolsky with some random person. 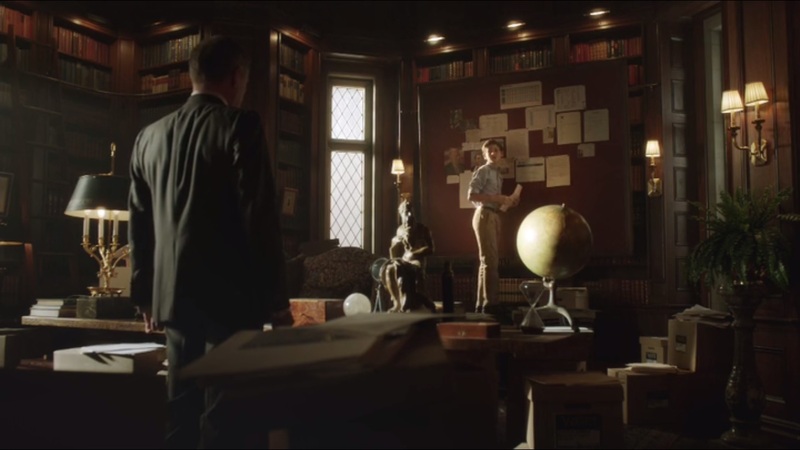 And Gordon happens to take a good look and figures that it must be a professor, just based on the book shelf? And more than that, Bullock had that box in front of him the entire time Gordon had gone missing. Are we to believe he never even looked through it? Their detective work wasn’t all that great, either. They actually just go asking random people on the street if they’ve seen the guy. Aren’t there other officers on the force who could help them with this? And later on in the very same episode, Gordon wants to look for Potolsky on foot, but Bullock suggests putting out an APB. Why didn’t they just do that the first time? Selina Kyle’s appearance was pointless this week. She seemed to pop up just to remind us that she was still out there when we’re plenty aware of that. And Gordon yelling out to her with burger in his mouth wasn’t a good way to make sure she stopped. So not a bad episode, but not great. Again, the idea of making Wayne Enterprises more sinister than we’d believe is a good way to keep Bruce and Alfred involved behind the scenes as they try to uncover how and why the mob may have been in cahoots with the organization. Fish and Maroni simultaneously trying to take out Falcone is building to looks to be an intense mob war. GCPD needs to start utilizing more than just Bullock and Gordon, though, because they aren’t all that good at their jobs. They just happen to get very lucky. Or poor writing. One of the two. This entry was posted in Gotham and tagged Alfred Pennyworth, Ben McKenzie, Bruce Wayne, Camren Bicondova, Cory Michael Smith, Daniel London, Danny Mastrogiorgio, David Mazouz, David Zayas, Donal Logue, Edward Nygma, Fish Mooney, Frankie Carbone, Harvey Bullock, Jada Pinkett Smith, James Gordon, Jeremy Davidson, Liza, Makenzie Leigh, Margaret Colin, Molly Mathis, Nikolai, Oswald Cobblepot, Robin Lord Taylor, Sal Maroni, Sarah Essen, Sean Pertwee, Selina Kyle, Sharon Washington, Stan Potolsky, Taylor Reece, Zabryna Guevara by omarid513. Bookmark the permalink. I actually liked this episode. Looking back at everything Batman, this episode gave a lot of insight into the future of Batmans Gotham in terms of the building of the rogues gallery (viper to venom, basically the birth of the supervillain), the intricate dynamic of the crime families (the Russian starting to grow out of Falcone and the rise of Penguin into a crime boss himself) and the darkness that swims in Gotham as a whole (the Arkham rehabilitation and it’s political implications). 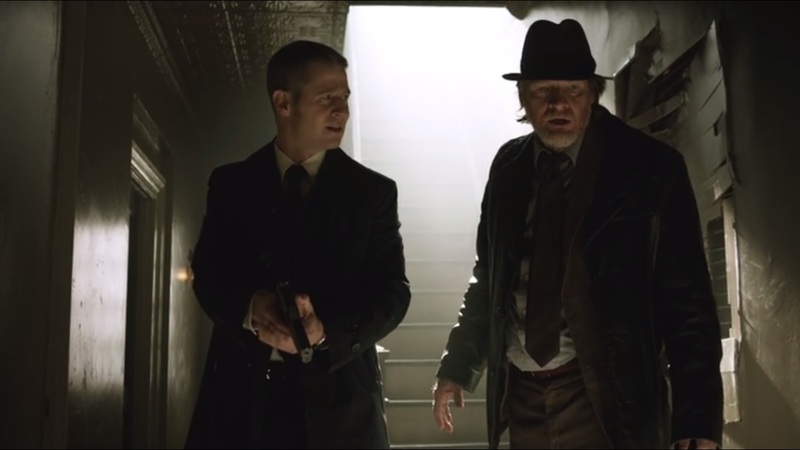 Yeah, the episode was by no means terrible, but little things like Gordon’s convenient hunches and the less than stellar detective work on a show centered around two detectives in Gotham City sometimes take me out of it. I do agree that they’re slowly planting seeds for future events, but I wish more focus would be on the now instead of reminding us of who these people will be. true. I guess I’m just biased, seeing my favorite fictional city slowly transpiring to prepare the arrival of the Batman.